Prior to this subway disaster, I made my first visit to the Union Square branch of Whole Foods. I have to say, I don't understand Whole Foods - it's like a crowded yuppie food playground of expensive designer organic foods, that are no healthier than the half-organic / half supermarket brands I normally buy, but cost twice as much. This is not to say that Whole Foods doesn't have some great stuff for select things, as they do (great cheeses, by the way), as well as some unusual things that are hard to find at conventional grocery stores, but it's just not necessary to do all of your routine grocery shopping at a place like Whole Foods if you want to cook with great ingredients. In addition, the shopping atmosphere at the Union Square Whole Foods is totally ridiculous. The check out lines are longer than the lines at Disneyland - I think you could get on Space Mountain sooner than you could reach the end of the full check-out at Whole Foods. There are two check-outs - one for people crazy enough to do a large grocery shop here, and one for people like me buying less than 10 items. The longer line was about a 40 minute wait. I waited for about 10 minutes. When I got to the end of the checkout line, there were beeping lights and an automated voice that told you which cashier to go to. Once you got the signal, you had to run to the cashier or someone behind you or from either of the lines beside you would beat you to the register. I managed to get it right on the second try. Whole Foods only wishes it could be as good as Wegmans - Wegmans has 1000 times better customer service, more space, many more food/products (there is NOTHING Wegmans doesn't carry, it is truly amazing), plus that friendly upstate New York vibe, minus all the urbanite uber-cool yuppies in a mad rush. Plus, the check outs at Wegmans are simpler and much better than the ones I experienced today. Wegmans has all the same expensive brands as Whole Foods but they also have the whole spectrum of alternatives from the generic brands to the designer brands, so you can decide what is best for each food product. Further, Wegmans heavily promotes their own brands, as my mom pointed out, which are generally very high quality. So what did I buy at Whole Foods - a few things I could not find at my local grocery stores in Park Slope (Associated, Union Market and Key Food), all of which probably would have been available at Wegmans. I bought a bag of Key Limes (for my next Key Lime Pie. I also bought some Meyer lemons and lingonberries, which I will be discussing in my next post. (I usually make this with some kaffir lime leaves as well, but I had run out. I guess I'll check for them next time I brave the lines at Whole Foods). 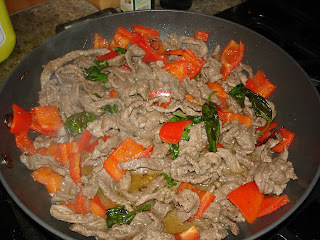 I did get a late start, but luckily this recipe is a quick and easy stir fry.